This spectacular group of young stars is the open star cluster NGC 3766 in the constellation of Centaurus (The Centaur). Image released June 12, 2013. A previously unknown kind of variable star is on brilliant display 7,000 light-years from Earth in a new photo taken by a telescope in the Southern Hemisphere. 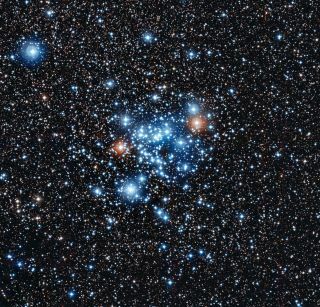 For years scientists have known that the apparent brightness of many stars changes over time, however, the kind of variable star seen in this new European Southern Observatory photo of the open star cluster NGC 3766 has not been studied in detail before. "The very existence of this new class of variable stars is a challenge to astrophysicists," Sophie Saesen, a team member from the Geneva Observatory, said in a statement. "Current theoretical models predict that their light is not supposed to vary periodically at all, so our current efforts are focused on finding out more about the behavior of this strange new type of star." The sun itself is a variable star. Through the course of its 11-year cycle, the star's energy output varies by about 0.1 percent — one-thousandth of its magnitude, or brightness. "We have reached this level of sensitivity thanks to the high quality of the observations, combined with a very careful analysis of the data, but also because we have carried out an extensive observation program that lasted for seven years," Nami Mowlavi, the leader of the research team, said in a statement. "It probably wouldn’t have been possible to get so much observing time on a bigger telescope." The stars observed by the team — whose research is published in Wednesday's (June 12) issue of the journal Astronomy & Astrophysics — are slightly brighter and hotter than the sun, but astronomers still aren't sure what is causing the variability in their brightness. Usually, the apparent brightness of a star changes because of complicated properties in the star's interiors. Astronomers might already have an idea of what could be causing the variability. All of the new variable stars observed in this study rotate at speeds that exceed half of their critical velocity — the maximum speed where stars become unsound and start to break apart, flinging their stellar guts into space, according to ESO scientists. "In those conditions, the fast spin will have an important impact on their internal properties, but we are not able yet to adequately model their light variations," Mowlavi said. "We hope our discovery will encourage specialists to address the issue in the hope of understanding the origin of these mysterious variations."